My daughters have a few recipes that they absolutely love and one of them is my Bacon Wrapped Stuffed Chicken. My oldest recently put in her food request for things that she wanted me to cook. Greedy much? One of the foods she requested was this chicken recipe but she calls them Chicken Roll-Ups. I have to admit that I love it too because it is super easy to make. It’s great for a night that you don’t have a ton of time to cook or if you are entertaining. The girls used to love helping me put the chicken together when they were younger and it’s a great way to get the kids in the kitchen. You don’t have to worry about them cutting their little fingers or anything of the sort. Plus, for some reason, children love playing in cream cheese. I’m not sure why but they do! LOL! I have to admit that it’s kind of cute when they are coming towards you with cream cheese fingers making monster noises. LOL! If you cook this chicken for friends, they will swear that it took you forever to whip it up. Most of us have the ingredients in our kitchens. When I tell you it’s super simple to make, I mean it’s super simple and you will have time to relax and unwind while the chicken is cooking. If you are like me, you are trying to stay on track and find foods and recipes that taste great and keep you on track. I love this recipe because it doesn’t include any of the foods that I try to run from while eating healthy. I know most people look at me like I’m crazy when I tell them I use “reduced fat” cream cheese but I promise you, you will not know the difference. 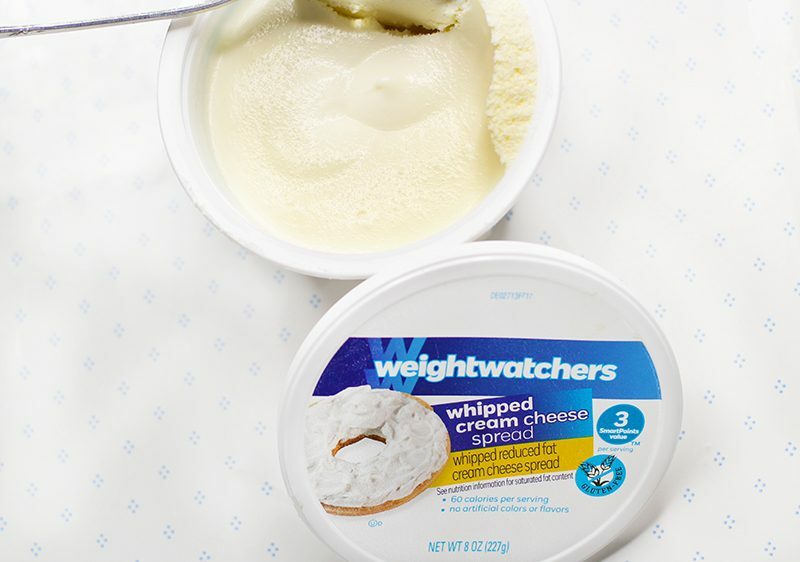 The Weight Watchers Whipped Cream Cheese tastes just like any other full fat cream cheese. I just love this one better because of the taste and convenience. 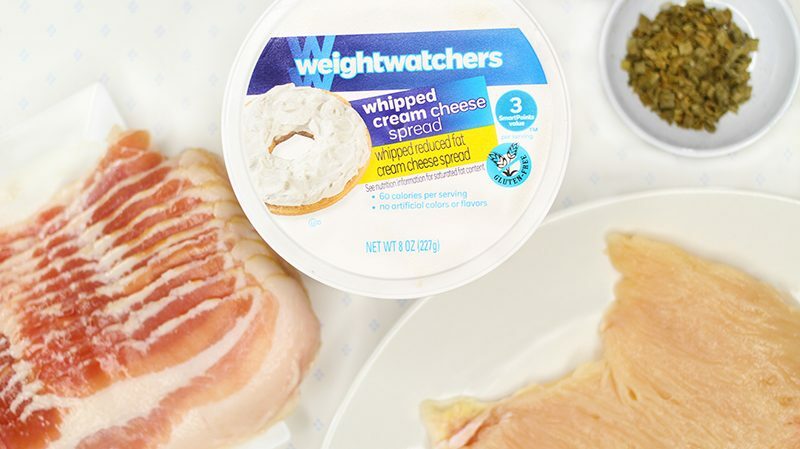 Before I forget, I let the cream cheese sit on the counter to make it a little easier to work with and I would definitely suggest that you do the same if you are using the Weight Watcher Original Cream Cheese. You want to make sure the cream cheese is softened. I love the Weight Watchers Whipped Cream Cheese because it doesn’t require as much work as a regular bar. I will note that I sautéed the mushrooms in butter with a bit of minced garlic and seasoning salt. While they were cooking, I seasoned the chicken breast with seasoning salt, Adobo seasoning, and pepper. I let the chicken marinate in the seasoning while the mushrooms finished cooking and cooled. 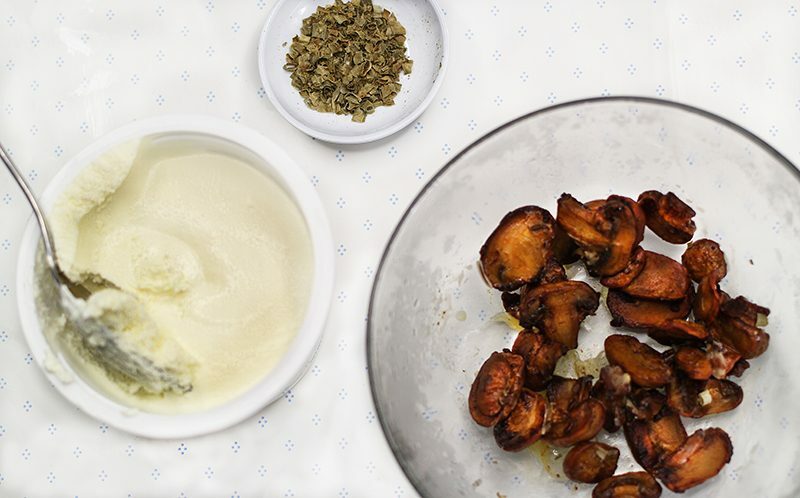 You can prepare the mushrooms the day before to save some time while prepping the day of. You know what? I think the next time my daughter asks me to cook this for her; I’m going to have her cook it instead because it’s time for her to work on her cooking skills. Anywho, enough of me chit chatting, let’s get to the video. 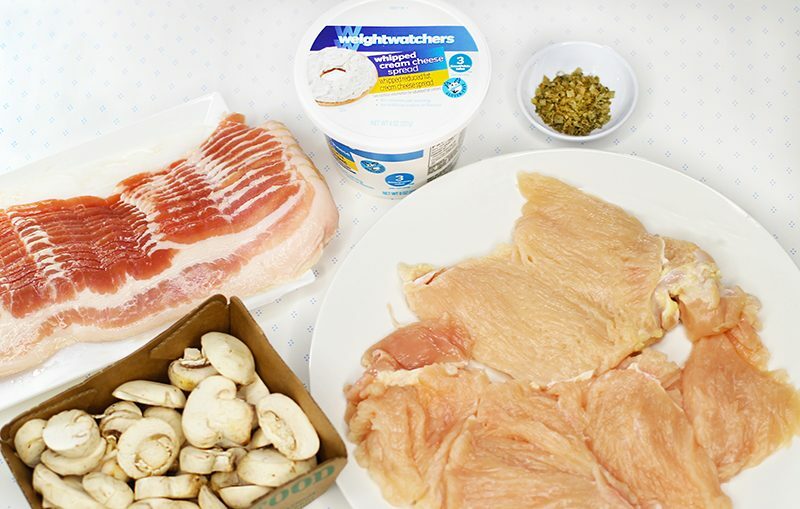 Slice the chicken breast in half and pound until a uniform thickness. Season with salt and pepper and set aside. Saute mushrooms in butter until tender. Remove from heat and allow to cool. Combine cream cheese, chives, mushrooms, onion powder, and garlic powder. Add 1-2 tablespoons of the cream cheese mixture to the center of each chicken breast. Roll or tuck each breast and wrap with bacon. Secure bacon ends with tooth picks and place in an oven preheated at 375 degrees. Bake for 45, turning after the first 20 minutes. 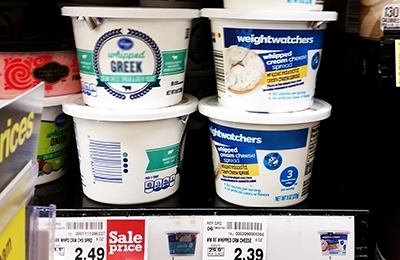 If you are on the hunt for any of the Weight Watchers cream cheese products, you can find them at your local Krogers. Here is where I found mine in the dairy case. If you decide to give this recipe a try, please let me know how it worked for you. 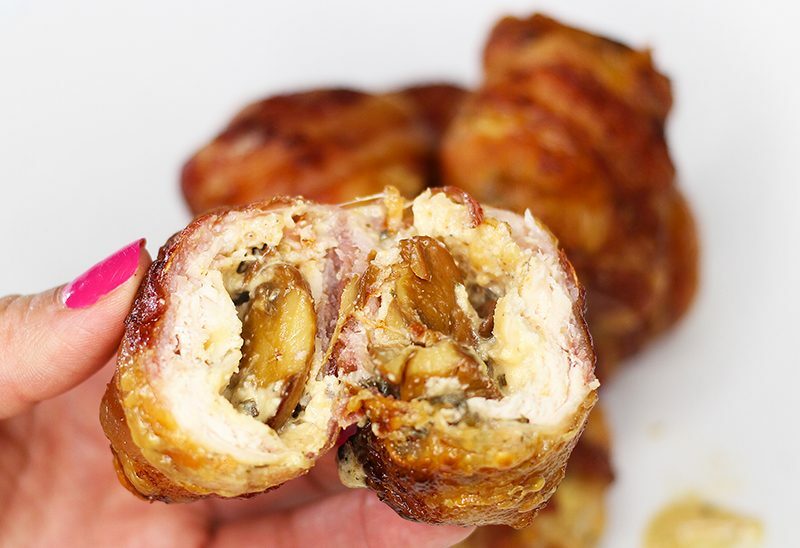 You can bake the Bacon Wrapped Stuffed Chicken in the over or pop them on the grill. I just finished opening and refreezing some slab bacon after using some for my bacon cheeseburgers for the 4th of July but now I know what to do with rest of this plus try out Weight Watchers cream cheese!! Plus mushrooms and butter make everything taste great too! This looks go good! 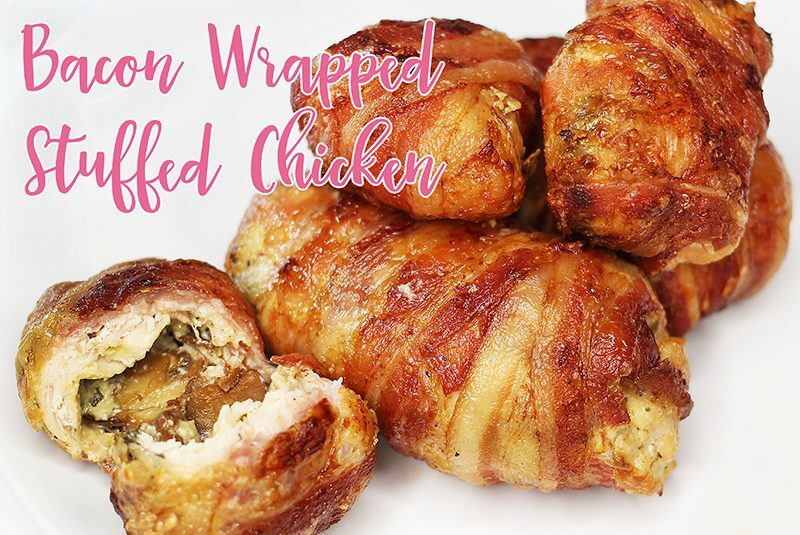 I’ve made similar but didn’t wrap it in bacon, but you really can’t go wrong with bacon! I like the combination of mushrooms and cream cheese. And who could go wrong with bacon? The mushrooms would be my favorite part! 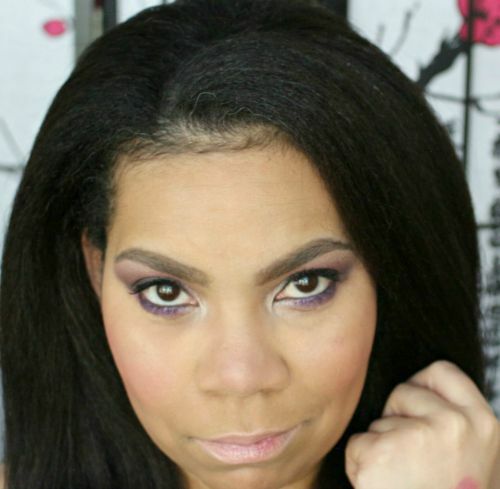 Girl… I watched your video and loved it. 🙂 I do something similar, but my mixture for the cheese is a tad bit different and I also love to add asparagus in the middle too. I swear we are soul sister twinsies. 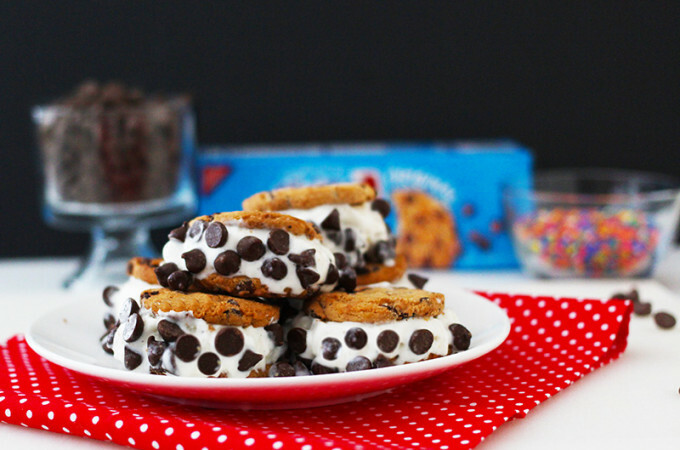 How delicious this looks. I can’t use cream cheese in cooking unless it’s only for me which isn’t a bad idea at all. MarciaF recently posted…Don’t worry, bee happy with our Beessential Giveaway! They love to cook. At one point, the youngest wanted to go to cooking school.